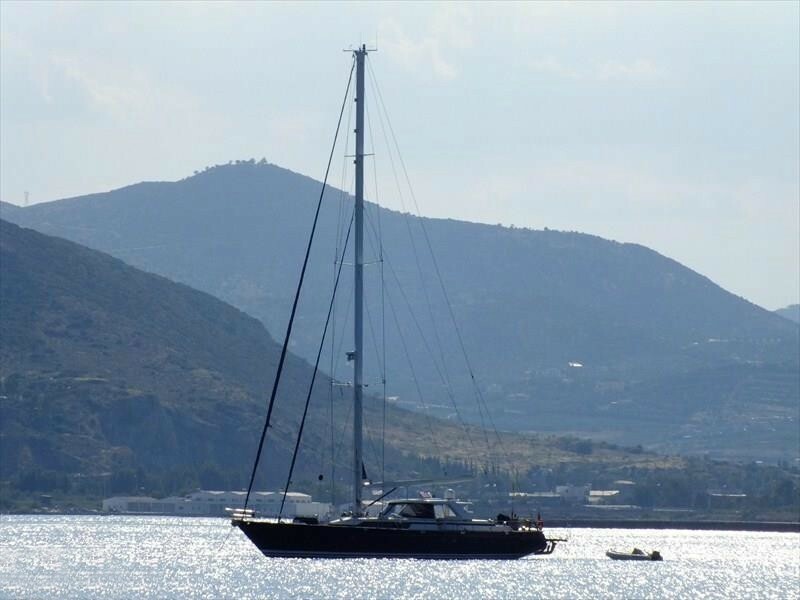 Luxury sailing yacht CENTURION (Ex Legatus) is a Maxi 88 design measuring 29,7m (97ft) overall with launch in 2007 and refitted in 2015. 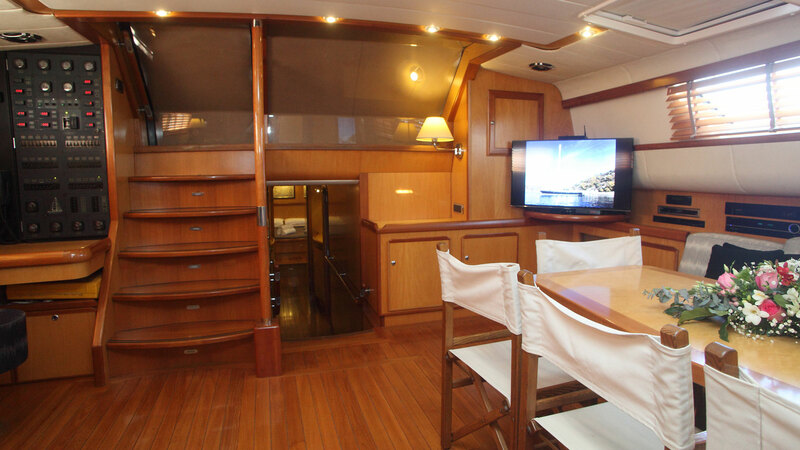 Her build is by CIM Rochefort and her naval architecture is the work of Sparkman and Stephens. 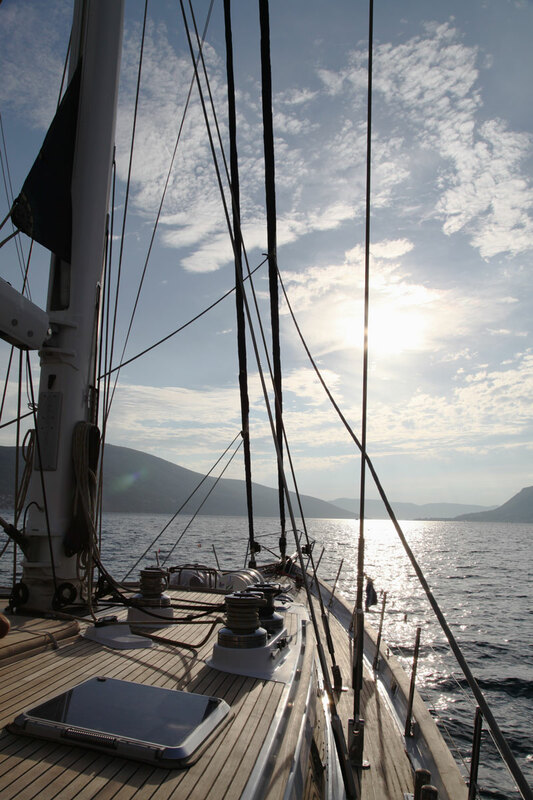 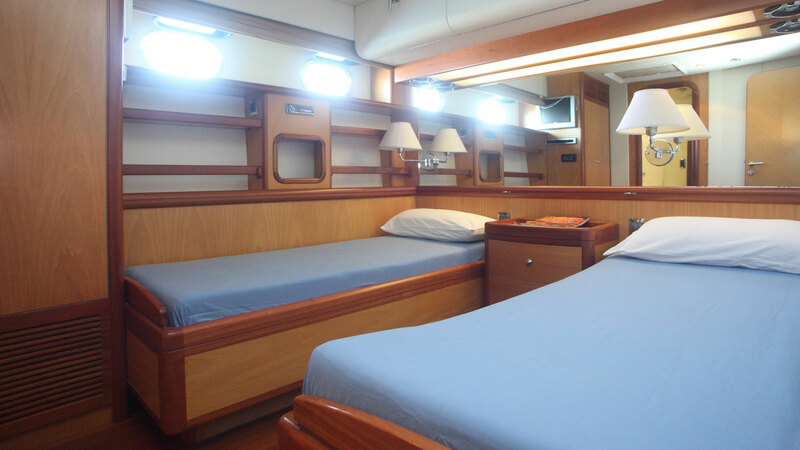 The yacht offers accommodation for up to 6 charter guests, in 3 spacious cabins. 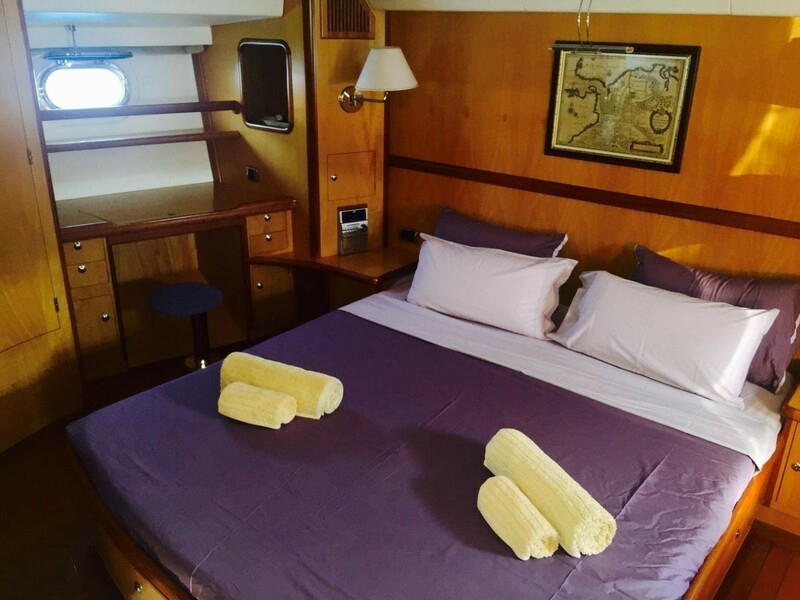 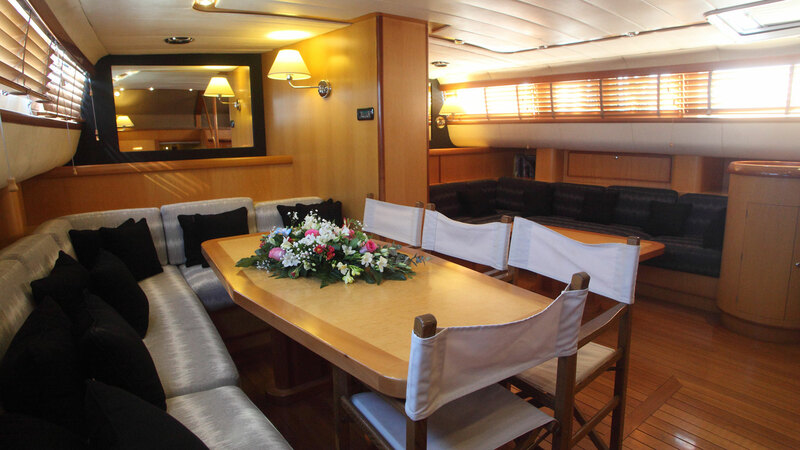 Below decks she has a contemporary timeless ambiance, with warm woods of Wild Cherry and Maple, and bespoke soft furnishings. 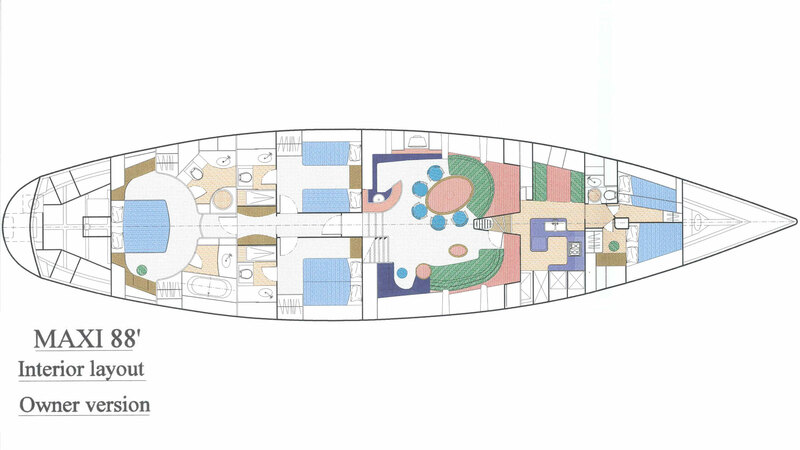 Her ample main salon offers an open plan formal dining and lounge space. 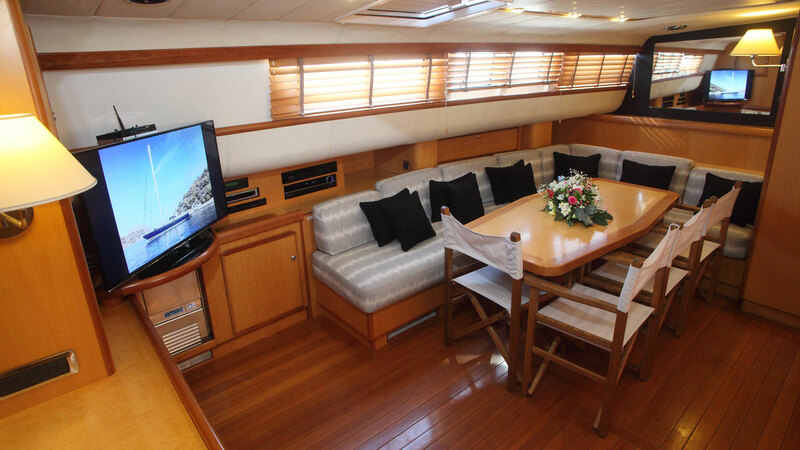 The lounge is set to starboard and has plush seating and a coffee table, while to port is a generous formal dining area and TV entertainment. 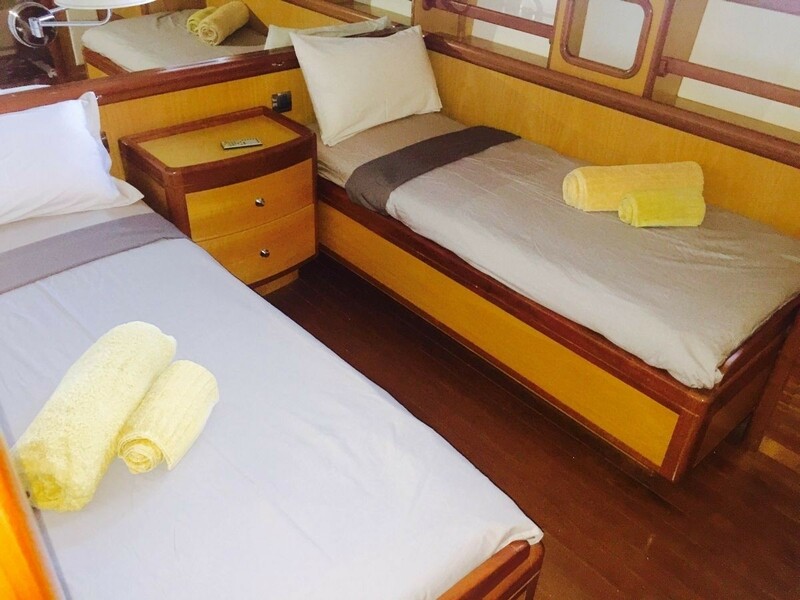 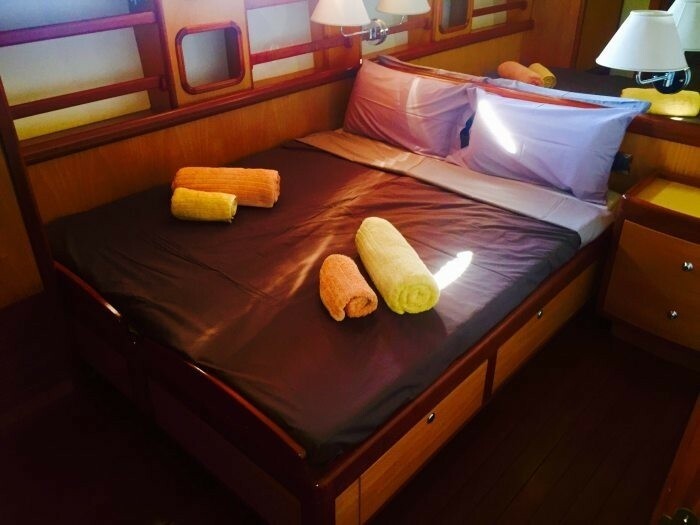 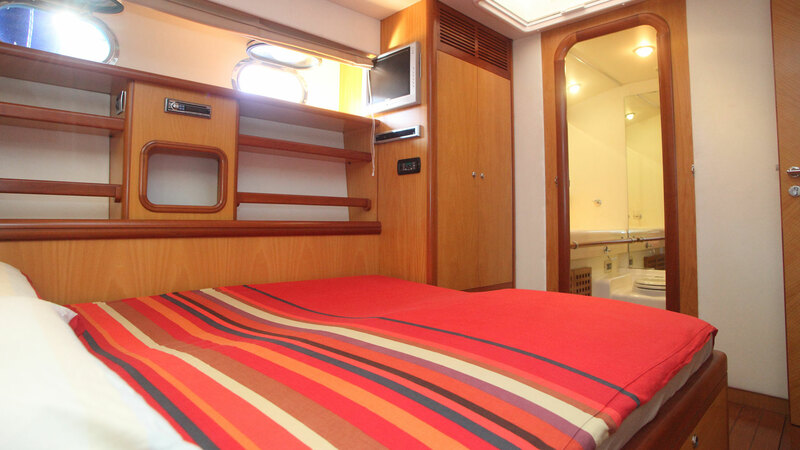 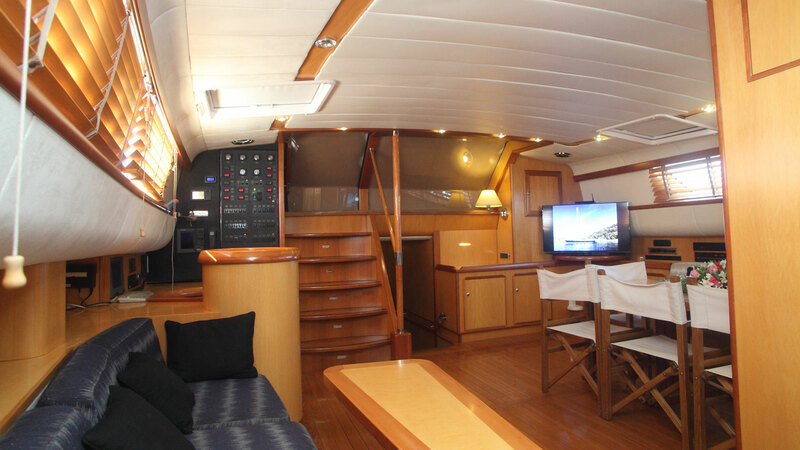 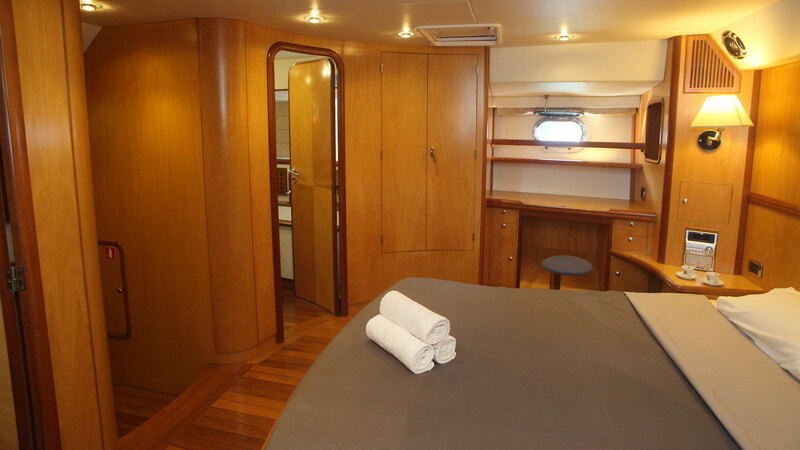 Accommodation is aft of the salon, in 1 master, 1 VIP and 1 twin cabin. 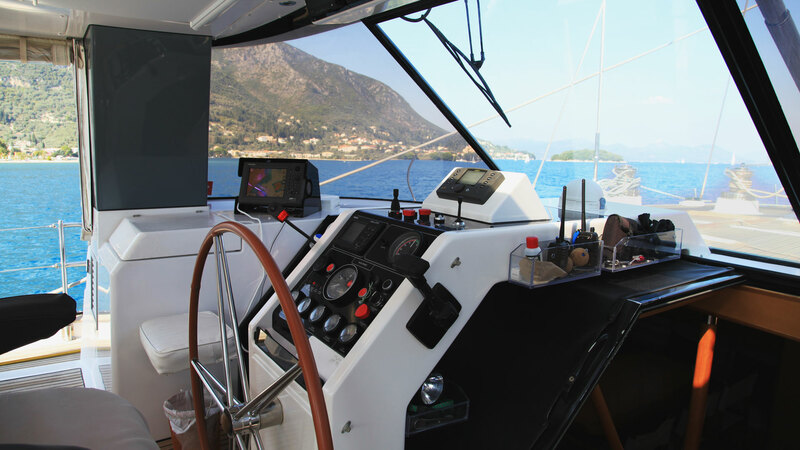 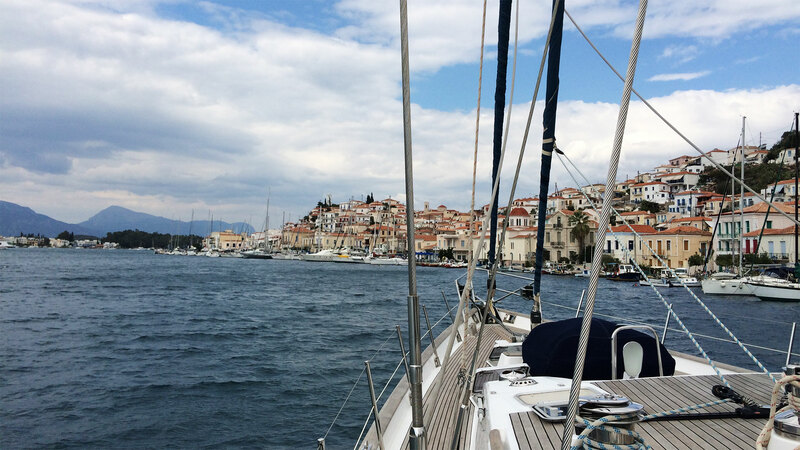 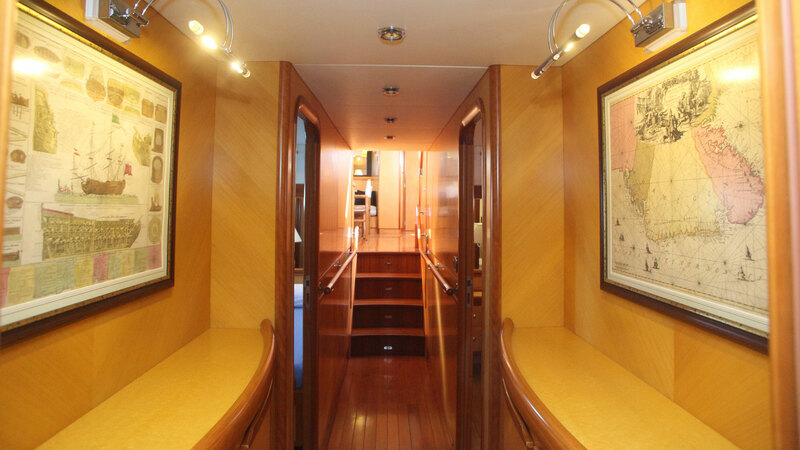 Her crew and galley are forward of the salon, ensuring optimum guest privacy. 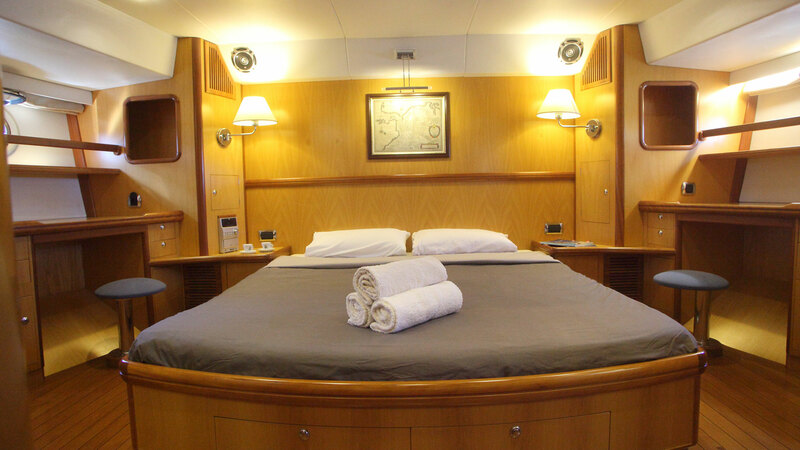 On deck, there are plenty of areas to relax and entertain. 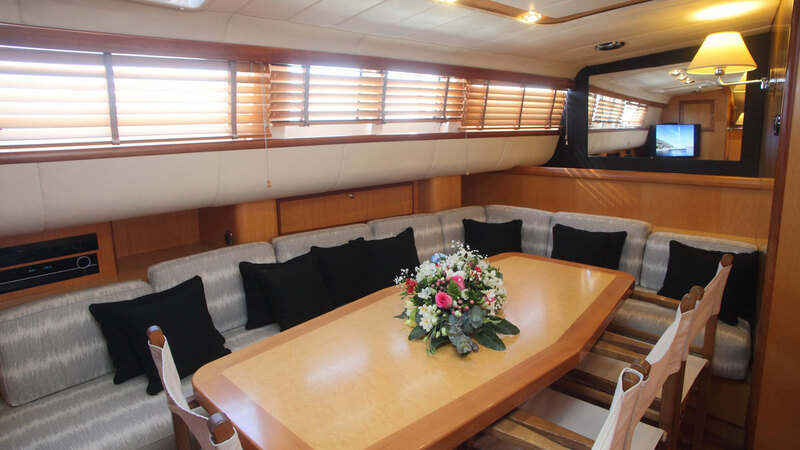 A shaded guest area offers an alfresco dining table and direct access to the companionway, leading to the main salon. 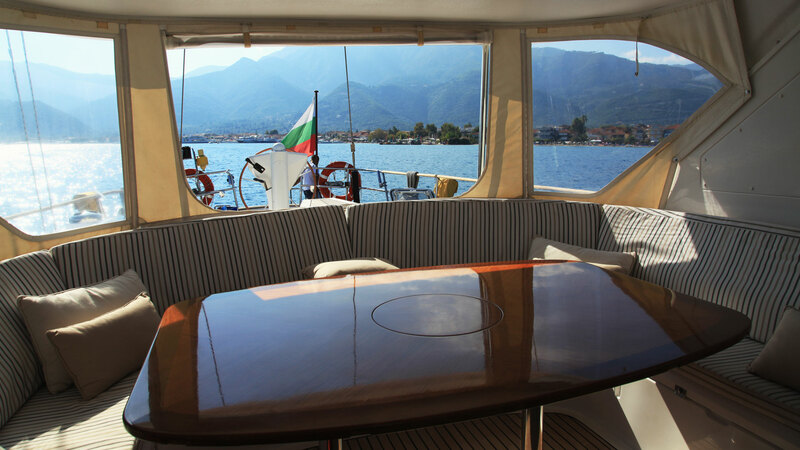 This area boasts full clear enclosure side curtains, ideal for any weather. 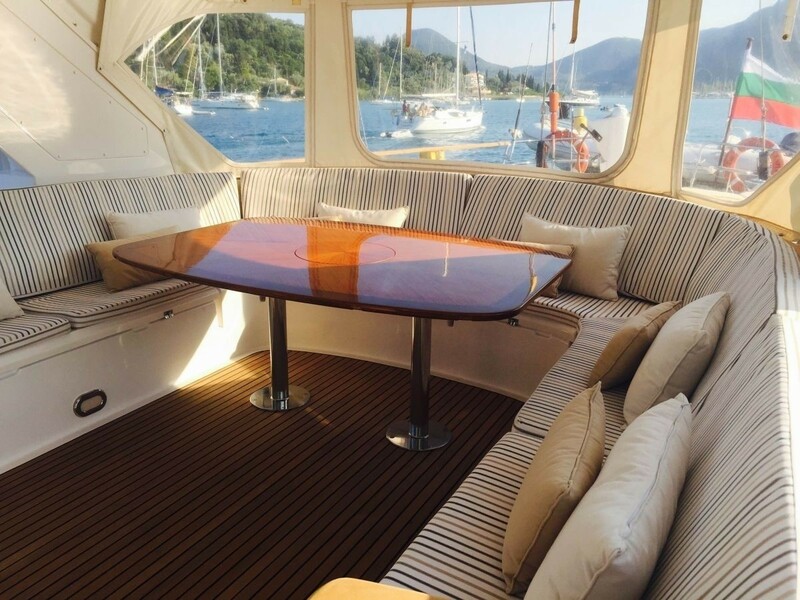 On the aft deck is a built-in seating space, perfect for any time, whether at anchor or under sail. 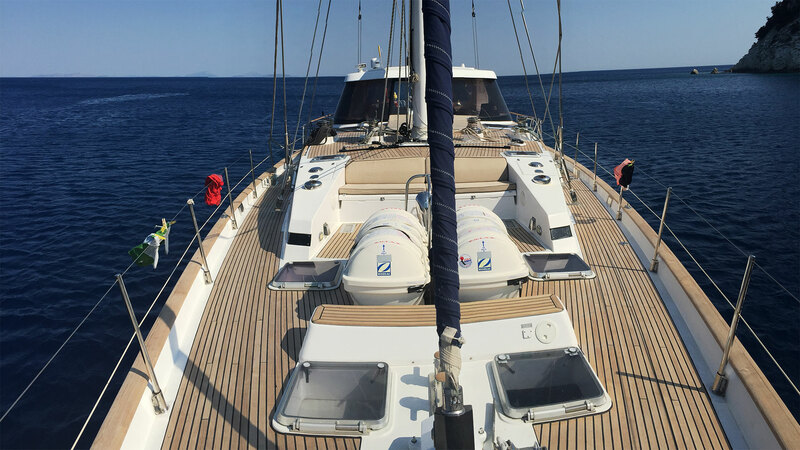 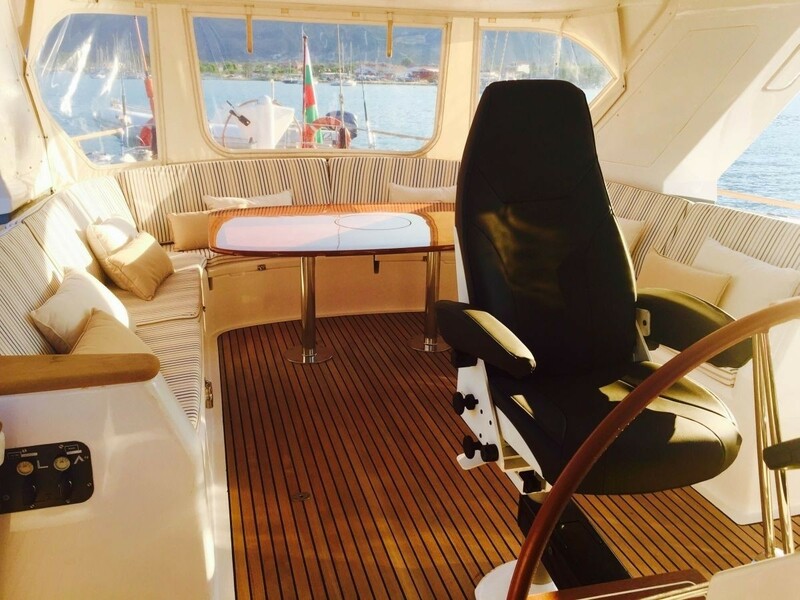 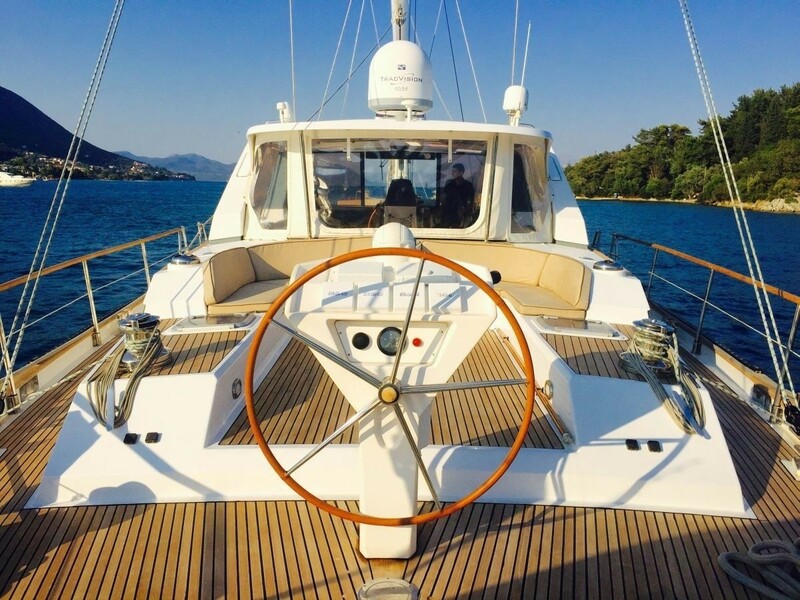 On the foredeck is an additional seating and sunning space. 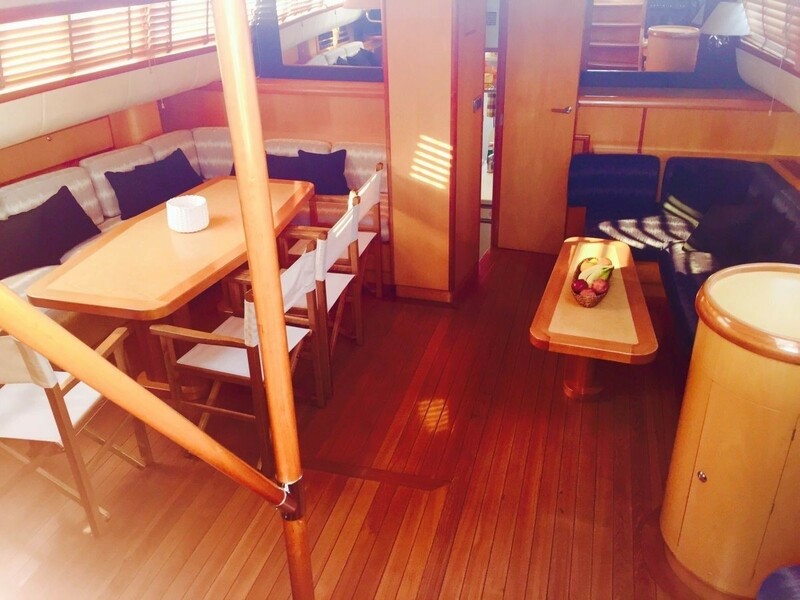 Her decks are all laid to beautiful teak. 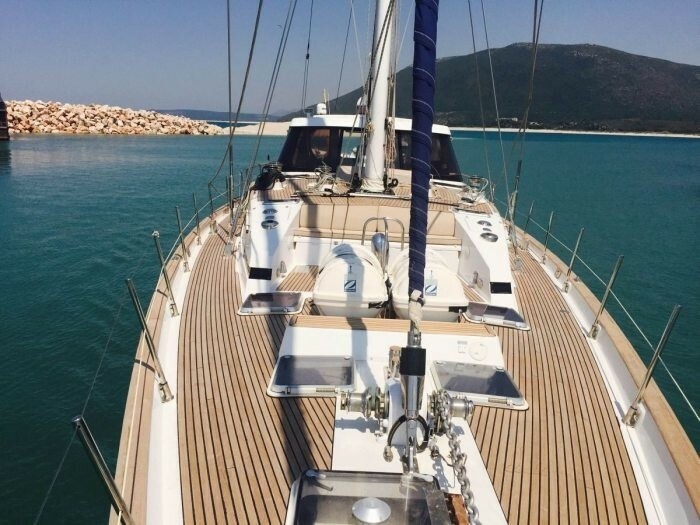 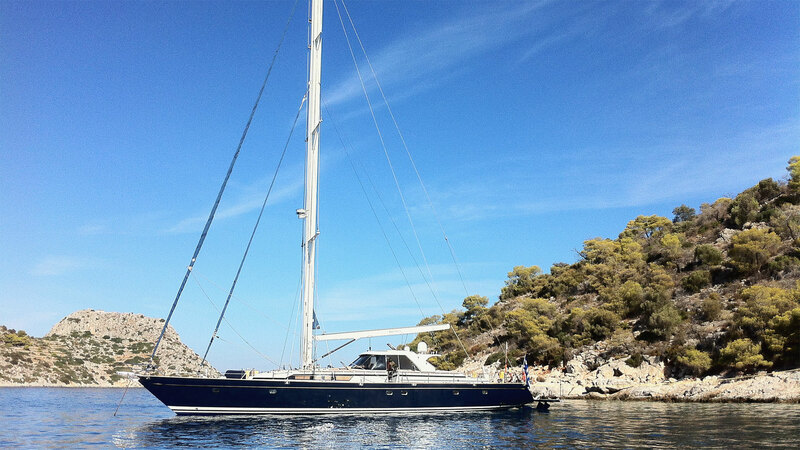 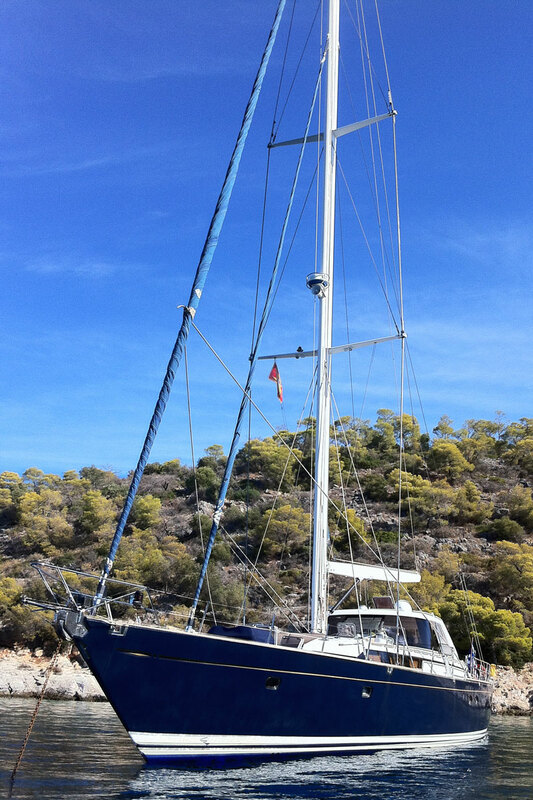 The yacht is a sloop rigged vessel with cruising speeds of 8 knots and top speeds of 10 knots. 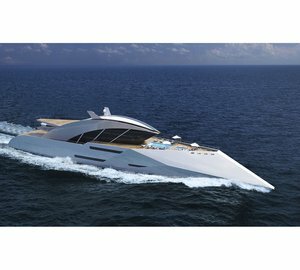 She is powered by a CAT 313hp engine, with a range of 600 nautical miles. 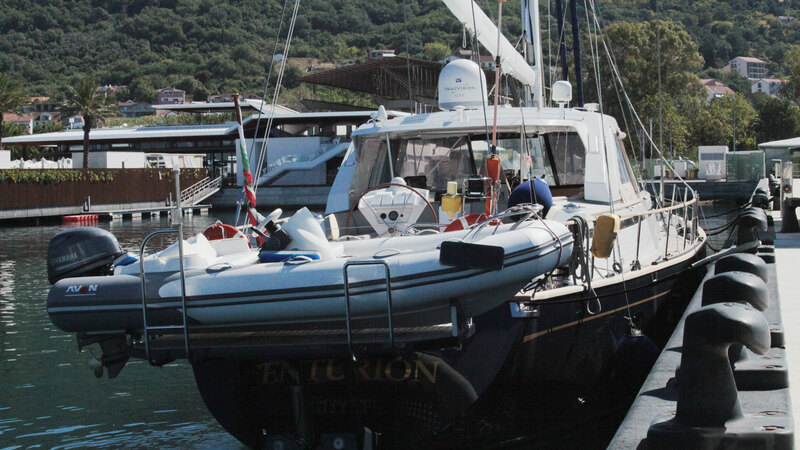 Tenders & Toys Swim Platform, Fishing Gear, Dinghy AVON Zodiac YACHTLINE II YL 420DL, 3 sets of scuba diving equipment + Bauer compressor on board Communications - NAV Central Unit B&G Hydra Standard Pack Hydra 2000 - GPS receiver Furuno GP 32 - Standard C Furuno Felcom 15 SMDSM receiver-transmitter - BLU receiver - Distress unit Cospas-SarsatKannad 406pro (pont) - VHF Furuno GMDSM 2721 12V (nav station) Audio Visual Equipment and Deck Facilities Saloon-lounge is equipped with a flat screen TV with DVD player, stereo system with 4 surround speakers, 2 waterproof speakers in the outside deck. 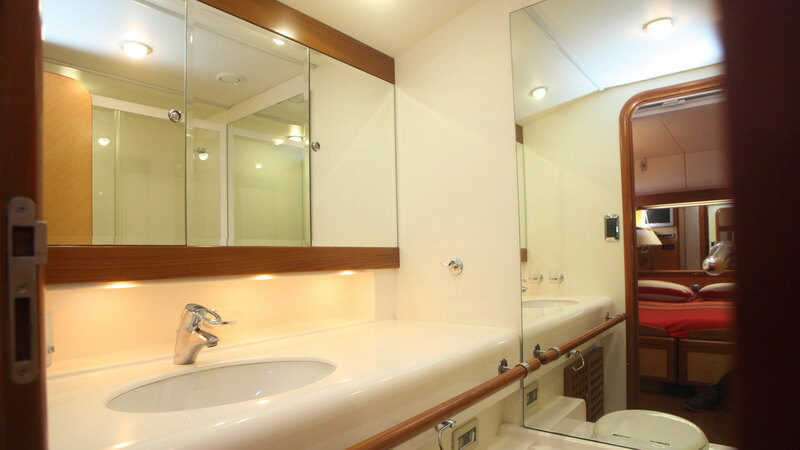 Cabins are equipped with flat screen TVs and radio-CD players.